Supporting your need to work with design files in other formats and with other tools, Altium Designer provides an exporter to export your PCB layouts to the Ansoft™ Neutral file format. Ansoft was acquired by ANSYS™, and therefore the Ansoft Neutral file format is also known after that time as the ANSYS Neutral file format. Altium Designer's Ansoft Exporter exports into version 4.0 Ansoft/ANSYS Neutral file format. The Ansoft Exporter can be installed alongside all other importers and exporters as part of initial installation of Altium Designer. Simply ensure that the Ansoft option - part of the Importers\Exporters functionality set - is enabled, on the Select Design Functionality page of the Altium Designer Installer. The Ansoft Exporter is selected for installation as part of the Importers\Exporters area of functionality. From the Installed page of the view, simply click the Configure button at the top-right - to access the Configure Platform page. 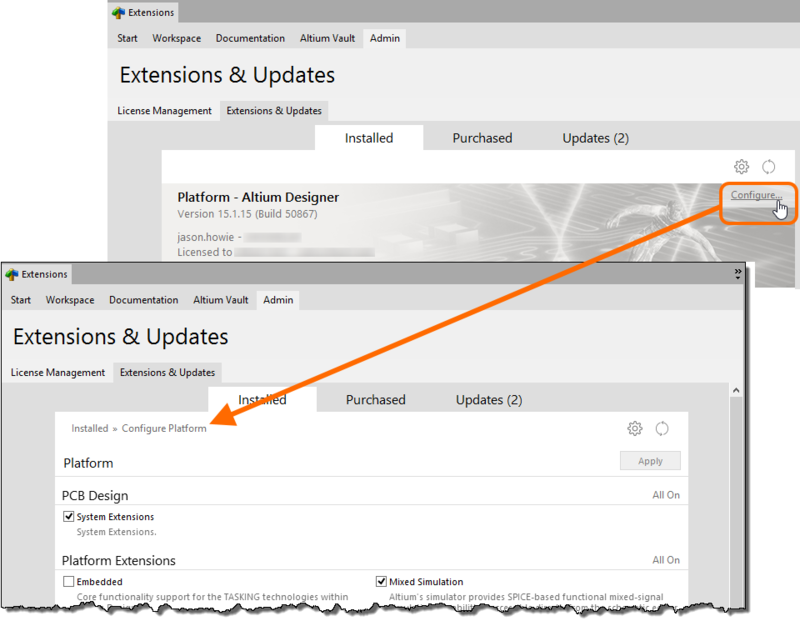 First access the Configure Platform page of the Extensions & Updates view. Scroll down the page and enable the entry for Ansoft, in the Importers\Exporters region of the page. Then enable the Ansoft option, under Importers\Exporters. Click the Apply button, back at the top-right of the page. 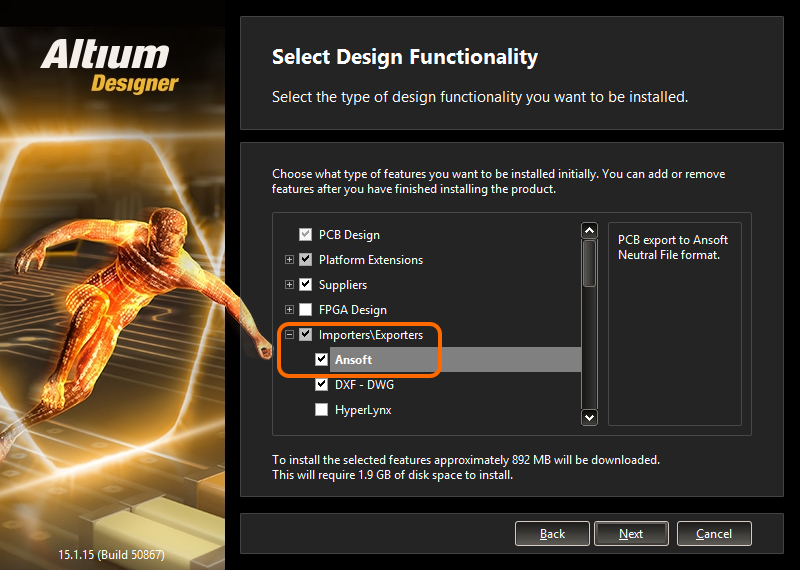 Altium Designer must be restarted for the changes to take effect, so click Yes at the dialog prompt. 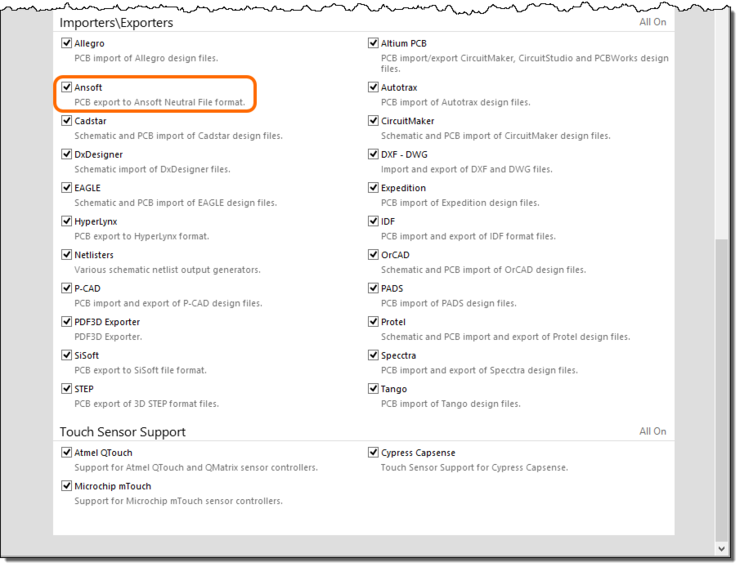 To access this feature, simply choose the File » Export » Ansoft Neutral command from the PCB Editor's main menus. In the Export File dialog that appears, specify where, and under what name, the file is to be stored. By default the file will be named using the PCB document name, and stored in the same folder as the parent project. The Ansoft exporter extracts component Value parameters from the components on the project's schematics - open the entire Project rather than just the board for the exporter to access these parameters. With name and location specified as required, click Save to proceed with the export. Once the export has completed, an Information dialog will appear to confirm - simply click OK in this dialog. ANSYS™ SIwave™ (which can also import data generated from Altium Designer in ODB++ format). All enabled copper, power plane, mechanical and overlay layers are exported. Layer-stack details, including copper thickness and dielectric properties (material, thickness and dielectric constant) are exported. Text strings are exported as objects rather strings, ensuring that their shapes are accurately represented in the ANF file, regardless of the font used in Altium Designer.